Nestled between China, Burma, Thailand, Cambodia and Vietnam is charming Laos. An agrarian society, Laos has largely escaped Western style development. You won't find a Big Mac or a KFC out here, though, I don't know for how long. Life is refreshingly simple and laid back. The Mekong, one of the greatest rivers of the world, nourishes Laos and forms its backbone. Luang Prabang and Vientiane are its top cities. The town of Luang Prabang is a UNESCO World Heritage site and is known for its Lao-French architecture. Vientiane is the capital. 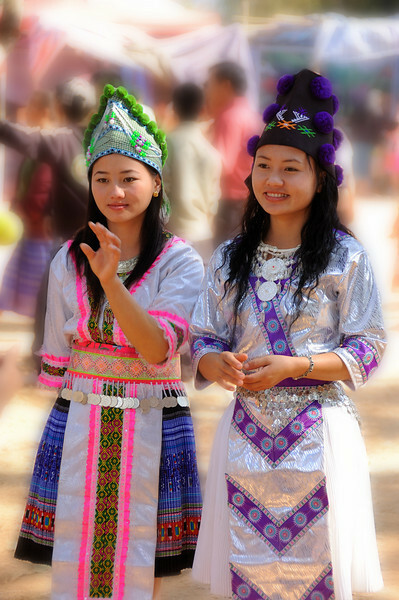 If you visit, please get out of your hotel room and take time to mingle with friendly and welcoming Laotians. Also, don't forget to include a large purse or a backpack in your travel gear. One US dollar at the ATM will give you a boat load of 'Kips', Lao's local currency. Enjoy the trip! I was in the car on my way back to the guesthouse when I was hit by the cacaphony of whistles, music, rainbow flags and outrageous costumes on the outskirts of Luang Prabang. It looked very festive and so I asked the driver to stop by the roadside. There was so much going on in the fairground. Anxious parents, relatives, friends and well wishers circled the ball game participants. Some were getting ready for the game while others were enjoying a feast having found their match. It was one huge party with colorful costumes and headgear.